Tia Truthteller is a wife and mom who is committed to supporting modern young women with traditional values. Her mission is to share her personal relationship "truths" so you can date to get the committed relationship you crave. Having lived abroad for 16 years, she came of age in a culture where intentional dating (dating with the aim of finding a life partner) was the norm, and shares real world practical tips and stories. This is the collection of home truths she has put together to pass on to her daughters. For all those who are dating or are interested in dating, Dating on Purpose: An Illustrated Guide to Intentional Dating for Commitment-conscious Millennials by Tia Truthteller is an excellent guide that will teach them how to fortify their psyche, determine if a guy really likes them, no matter what they feel, respond powerfully to men who behave like cowards, identify signs if he is marriage material, how to get a closure after a breakup, and many other tips that will make the process of dating easier. All young women want meaningful relationships and they always wonder if they can find a worthy partner. Readers can take the suggestions in the book that resonate with them, depending on the type of guy they are dating. The author handles a relevant topic with ease and expertise, and the relationship opinions and truths she shares are helpful and can be applied to one’s dating life. Reading the book will make readers confident of dating, and the components of long-term dating mentioned in the book are useful to assess relationships properly. The book is insightful and thought-provoking, and definitely an eye-opener for all those embarking upon a date or who are already dating. I found the book a good tool for change so that we expose ourselves to opportunities to meet people and make ourselves approachable. The book also helps readers take the reins of their love life and get comfortable with the idea of leaving relationships which are not giving them what they want. Yes ladies! I have found my holy grail of dating books. Dating on Purpose is the truth! Never has a dating book out there kept it as real and classy as this one does. 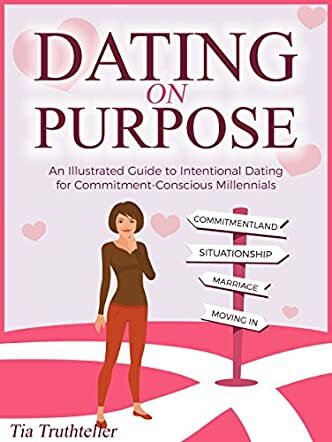 As a marriage-minded female with a few prime dating years left in her tank, I found this book to be very insightful, enjoyable and 100% relevant to modern dating. It helped me see some of things I had been doing wrong and made me fervently wish I had read a book like this a decade ago. Tia Truthteller is that aunt who is clearly rooting for you and knows that being firm and honest in delivering her dating truths will help get us single gals get our desired outcomes. I like the fact that she doesn’t just share insights on understanding men but also stresses the importance of how we need to Woman Up first so we can date like bosses and show up as high value in this dating market. This book is a one-stop shop on all we need to know on how to date strategically, it is definitely a must-read for every single girl out there who’s trying to navigate the dating jungle of today. Definitely worth reading. Dating on Purpose provides clear and relatable examples for various dating situations. I'm glad I did purchase the book even though I wasn't sure what to expect as I am not the target audience. Being a Gen X Mom with two daughters and a son who are millennials, this has given me additional support to hopefully guide them into a committed relationship. I am likely not the target audience for the book Dating on Purpose. I am a baby boomer male not a millennial female. When I realized this I felt vaguely guilty looking in on a topic for young ladies in there PDY. Not a middle aged widower who recently joined an online dating site. In my defense it was informative and educational and would recommend the book to any mature person who wishes to navigate towards success in relationship. However, it is definitely a good, and most applicable book, for the young lady in her prime dating years. It was nice to know that the premise is to navigate to a committed, even monogamous relationship in this new more open society. If you want some non judgmental advice on Dating with Purpose get this book! I was giving a complimentary copy of this book through Reading Deals for my honest review. This book is legit such a great read!! Ladies are constantly settling for less and just "going with the wind". I read this book and was like "yasssss honey! Preach!" I loved it and I recommend it for every lady who wants to desist from "basic" oriented men and get the right man! Great job Tia !